“Visitors will see the community from a different perspective as we open the doors to our past, present, and future. The house tour has become one of the Trust’s most anticipated annual events. If you love history and architecture, you will not want to miss this year’s tour,” enthused house tour chair Pattye Benson. 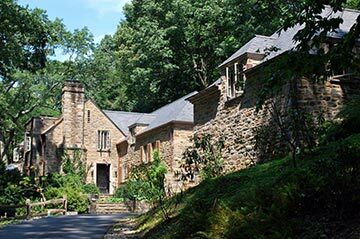 The 8th Annual Historic House Tour, returning with much anticipation on Saturday September 22nd, will take guests behind the scenes of nine historic and breathtaking properties in Tredyffrin and Easttown Townships. Visitors will discover the rich, architectural heritage of the area as they explore private residences, two barns and a historic church…and more! The featured properties span 18th, 19th and 20th centuries and visitors are invited inside for a glimpse of what it is like to live, work, and worship in these unique historic structures. The Duportail House, circa 1740 farmhouse in Chesterbrook, will be the featured ticket pick-up point for the 2012 House Tour. General Louis Lebeque Duportail, chief engineer of the Continental Army, used Duportail House as his quarters during the Valley Forge encampment of the Revolutionary War. Due to a recent restoration project, the Federal Barn on the Duportail property will be open for house tour visitors. The Federal Barn also referred to as the ‘Signature Barn’ dates to 1792 and is purported to be the oldest signed bank barn in Pennsylvania. It was placed on the National Register of Historic Places in 1979. The 8th Annual Historic House Tour includes two historic properties in Easttown Township, including the original home of Dr. Stanley Miller of Berwyn. The striking fieldstone construction of the circa 1938 doctor’s home and office possesses the architectural character of a home much older than its actual years. Only the second owners of this historic treasure, the current owners have spent the last decade restoring the home, while maintaining its integrity and original, unique architectural features. Tredyffrin Historic Preservation Trust welcomes Life’s Patina at Willowbrook Farm as the host sponsor for this year’s house tour. Four to six times a year, Life’s Patina owner Meg Veno hosts barn sales where magic is created in the stone barn of Willowbrook Farm! Each sale includes antiques, unique gifts, artwork and much more. By special arrangement, the Fall Barn Sale will correspond with the 8th Annual Historic House Tour and visitors can enjoy the sale in addition to the house and grounds of Willowbrook Farm. As is the owner’s custom, the nonprofit organization is chosen to receive portion of the barn sale proceeds and Tredyffrin Historic Preservation Trust is honored. The historic properties and gardens will be open from 12 noon to 5 pm on Saturday, September 22nd, rain or shine. Knowledgeable guides staff each home on the tour and house tour admission includes individual house history with map and parking details. Tickets are $35 and are available online at tredyffrinhistory.org using your credit card or downloadable order form and mail with your check to Tredyffrin Historic Preservation Trust, PO Box 764, Devon, PA 19333-0764. If you would like additional information about the house tour, kindly consult tredyffrinhistory.org, call Pattye Benson at 610.644.6759 or email info@tredyffrinhistory.org All proceeds are tax deductible as the trust is a registered 501c3 organization.